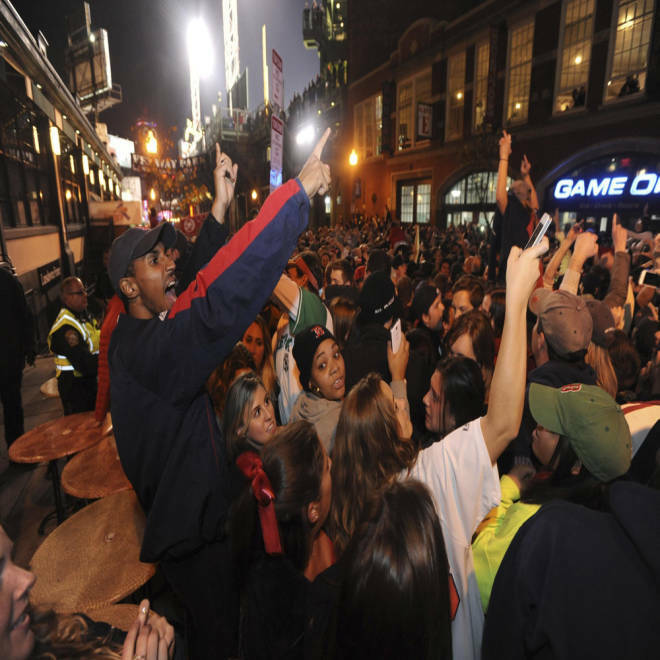 Red Sox fans celebrate near Fenway Park late on Wednesday. Six months after twin bombings shattered the city, Boston culminated its comeback Wednesday night, clinching its first World Series title at Fenway Park in 95 years. Thousands of fans spilled out onto the streets to celebrate the 6-1 victory over the St. Louis Cardinals — Boston’s third World Series win in the last decade — with many massing at the finish line of the Boston Marathon, where a pair of horrific blasts April 15 killed three people and wounded 264 others. Over the course of the six-game series, players wore “Boston Strong” logos on their left sleeves, and a giant “B Strong” logo was mowed into Fenway’s outfield. Fireworks lit up the night sky and the bars and restaurants in Yawkey Way were overflowing with revelers. As his teammates reveled on the field around him after the game, Sox slugger David Ortiz took a microphone and addressed the city, just as he did a week after the marathon bombings in April. "This is for you, Boston. You guys deserve it," the Series MVP said. "We've been through a lot this year and this is for all of you and all those families who struggled." Said left-fielder Jonny Gomes, one of several new additions to this year's roster: I don't think we put Boston on our back. I think we jumped on their back. They wouldn't let us quit." But thousands of others joyfully savored the moment. "Words cannot describe how I feel," fan Sam D'Arrigo told The Associated Press. "This is what being a Boston fan is all about." 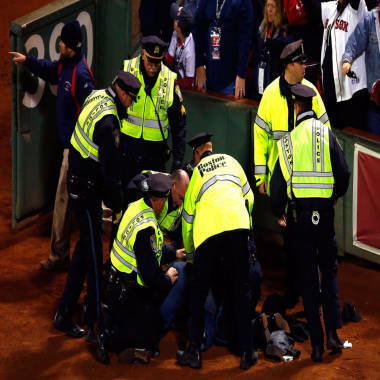 Police subdue a fan after the Red Sox won Game 6. Mayor Tom Menino also got in on the action, tweeting: "Get the ducks ready, we're having a parade," a reference to the duck boat parades the city had had during previous sports celebrations. The win marked the first time since 1918 that the Red Sox sealed a World Series at Fenway Park. Their 2004 and 2007 titles were both secured on the road. Meanwhile, in New Hampshire, some celebrations turned destructive at several college campuses. In the largest incident, University of New Hampshire officials say police used pepper spray and pepper balls to break up a crowd of several hundred students that had gathered at the Durham campus.